In this delicious collection of new recipes, Madhur Jaffrey shows us that Indian food need not be complicated or involve hours in the kitchen. Take a few well chosen spices and readily available ingredients, and in a few easy steps you can make a delicious prawn curry from Goa; succulent chicken baked in an almond and onion sauce; hearty Sri Lankan beef with coconut milk; a creamy potato and pea curry; tasty swiss chard stir fried with ginger and garlic; and a spicy dip with beans (canned of course), cumin, chillies and lime. With over 175 clear, simple and accessible recipes, this mouthwatering cookbook is as beautifully written as her bestselling Ultimate Curry Bible, and is fully illustrated throughout with gorgeous colour photography. Miss Jaffrey is the author of An Invitation to Indian Cooking (Alfred A. Knopf, 1973, Vintage in U.S.A., Jonathan Cape and Penguin in the U.K.) which Craig Claiborne of the New York Times described as “one of the finest, most lucid and comprehensive books on Indian cooking ever published.” It remains in print today. Her next cookbook, Madhur Jaffrey’s World-of-the-East Vegetarian Cooking (Alfred A. Knopf, Jonathan Cape), was published in America in 1981. Mimi Sheraton of the New York Times immediately put it on her Christmas list of the six best cookbooks of the year. Moira Hodgson, also of the New York Times, chose it as a selection for her Kitchen Library column, calling it a “highly original, enticing cookbook.” Miss Jaffrey’s vegetarian book went on to win an R.T. French Tastemakers Award for 1981. Craig Claiborne, in his book, “A Feast Made for Laughter”, said, “If, through some miracle, I decided to resort to a vegetable diet forever, this new book by Madhur Jaffrey, who is to my mind the finest authority on Indian cooking in America, would be my Bible. It is by far the most comprehensive, fascinating and inspired book on vegetable cookery that I have encountered. Whether you are a vegetarian or not, it is a valuable work offering an incredible number of good recipes to appeal to any cook.” This same vegetarian book, which remains in print, was published in the United Kingdom under the title, Eastern Vegetarian Cooking in 1983. Miss Jaffrey taped an eight-part cookery series for BBC Television in England. The half-hour segments, entitled Madhur Jaffrey’s Indian Cookery, were aired nationally in the United Kingdom starting in September, 1982. The series has been repeated in the United Kingdom more than five times already. It has proved a phenomenal success. A cookbook, published by the BBC to accompany the series, was on the best-seller list for a record eleven months and continues to sell exceedingly well. The television series has been shown at least twice in the United States, Ireland, most of Western Europe, New Zealand and Australia. In May, 1983, Miss Jaffrey was given the Glenfiddich Award for Best Radio/Television Broadcaster of the Year for 1982. This is the most prestigious food and wine award in the United Kingdom. Miss Jaffrey won it for her television cookery series. 1989. Miss Jaffrey’s three-year project for the BBC came to fruition: an eight-part TV series, Madhur Jaffrey’s Far Eastern Cookery, shot on location, on the foods of eight countries of the Far East — Korea, Japan, Hong Kong, the Philippines, Vietnam, Thailand, Malaysia and Indonesia. A cookbook and video of the same name accompany the series. The Sunday Times magazine serialized the book over three weeks. The book, in its very first week jumped on to the best-seller list. The series has received ecstatic reviews in the U.K. Harper and Row published the book in America late in 1989. The TV series followed on PBS and later on the Food Network. The New York Times selected the series as one of the two best shown that year (1992) on television. 1990. Miss Jaffrey wrote and presented Listening To Volcanoes, a very personal TV documentary on colonialism and its aftermath in the Spice Islands of Indonesia for PBS’s Travels series. This was shown on BBC 1 in the UK and on PBS in the United States in ‘92. At year’s end in 1991, Miss Jaffrey was among ten people– “chefs, teachers and food writers who tune our palates” — honored by New York magazine for changing the way New York eats. Miss Jaffrey’s 1993 publication, A Taste of the Far East (Clarkson Potter/BBC/Pavilion) went on to win two 1994 James Beard awards — for the Best International Cookbook as well as Cookbook of the Year. In 1993, Miss Jaffrey published Quick and Easy Indian Cookery (BBC) in the U.K. and An Indian Spice Kitchen (Carol Southern Books) in the United States. Her next children’s book, Market Days was published in early 1995. In 1993 Miss Jaffrey also won the Taraknath Das Award given by Columbia University for her contribution to Indo-American understanding through her work in the fields of acting and cookery. 1994 saw Miss Jaffrey completing a six-part BBC TV series on regional Indian food, Madhur Jaffrey’s Flavours of India. Shot on location in India, it was accompanied by a regional Indian cookbook with the same title. The book and the series came out in early March, 1995. In the United Kingdom, the TV series was rated in the top ten for the six weeks it ran and the book, both hard cover and trade paperback went on the best-seller list immediately. May 1995 saw Miss Jaffrey inducted into the Who’s Who of Food and Beverage in America by the James Beard Foundation. 1996 saw the publication of two more cookbooks in the U.K., The Essential Madhur Jaffrey and Madhur Jaffrey Cooks Curries as well as the launch of a line of sauces and chutneys in supermarkets throughout the U.K.
I997. Miss Jaffrey’s newest Children’s book, Robi Dobi: The Marvellous Adventures of an Indian Elephant (Pavilion in the U.K., Dial in the States.) won a Parents’ Choice” Silver Honor. The New York Times Book review referred to it as “a charming tale remembered from the author’s childhood” whereas the Book Review of the London Times said, “I enjoyed it so much I could not stop….It is a sparkling, imaginative tale.” Miss Jaffrey was also inducted into the World Food Media Awards Hall of Fame in Adelaide, Australia. 1998: Miss Jaffrey just won the Silver Spoon award given by Food Arts magazine for her contribution to popularizing Indian food in America. 1999: Miss Jaffrey given an Award for Excellence by Governor George E. Pataki and the New York State Division for Women in recognition of Women’s History Month for changing America through her work in the fields of cooking and acting. 1999: An Invitation to Indian Cooking, Miss Jaffrey’s first cook book, was reissued in hardcover in April by Ecco Press. It has been in continuous print for 27 years. 2001: Miss Jaffrey appeared in Friends for Dinner, a cookery show for the BBC in the UK and Ready, Steady Cook and Cooking Live for the Food Network in the USA. Miss Jaffrey’s newest books, Step-by Step Cookery, published by Ebury Press in the UK and by Ecco Press (Harper Collins) in the States, are published as is Quick and Easy Cookery, Ebury Press, and Foolproof Indian Cookery, BBC Books. 2002: Miss Jaffrey’s Step-by-Step Cookery won the James Beard award for Best International Cookbook. 2002: Miss Jaffrey wrote Sweet Memories for the New Yorker magazine. 2003: Passage to Pakistan, Miss Jaffrey’s article for Saveur magazine, won the IACP Bert Greene Award for Food Journalism in the Magazine category. 2003: In the Autumn, Miss Jaffrey’s newest book, The Ultimate Curry Bible, was published by Ebury Press in the UK and by Clarkson Potter (with the name, From Curries to Kebabs) in the United States. This year also saw a new edition of Madhur Jaffrey’s Indian Cookery (Barrons and BBC Books), which has been in continuous print since 1982 and has already sold close to a million copies. 2004: From Curries to Kebabs/The Ultimate Curry Bible, won the James Beard award for The Best International Cook Book in the United States and the Food Writers Guild Cookbook of the Year Award in the U.K.
2006: The Paperback of Climbing the Mango Trees was released and called, “enchanting…redolent of spices and the smells of cooking all under the Indian sun” (Daily Express on Climbing the Mango Trees). In 2006, Miss Jaffrey’s first cookbook, An Invitation to Indian Cooking, was inducted into the James Beard Foundation’s Cookbook Hall of Fame. 2008-9: Miss Jaffrey has been writing regularly for the Financial Times, Weekend Edition. 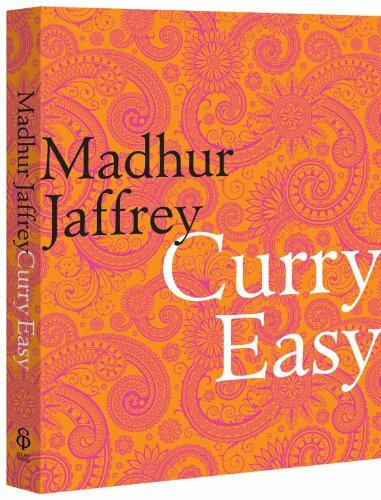 2010: At Home with Madhur Jaffrey, called Curry Easy in the UK, contains recipes from India, Pakistan, Bangladesh and Sri Lanka. Miss Jaffrey has been giving cooking classes privately since 1973. She is also an illustrator. She did all the decorative drawings for her first cookbook. The illustrations for a book entitled Shakti, published in the States by Knopf, won for her an award from the American Institute of Graphic Arts. This award was given to the Fifty Best Designed and Illustrated Books of 1974. In addition to writing cookbooks, Miss Jaffrey has written scores of articles for magazines and newspapers on subjects as varied as Bhutanese dance, ancient Indian cave paintings, the preserved body of St. Francis Xavier, restaurants in the Soviet Union, and inns in the south of France. The publications she has written for include the New York Times, the London Times, the Sunday Observer (London), Smithsonian, Saturday Review, Gourmet, Vogue, The International Review of Food and Wine, Travel and Leisure, Signature, Ms., House and Garden, House Beautiful, Bon Appetit, Organic Gardening, Art and Antiques, The New Yorker and Saveur. Miss Jaffrey continues to write for magazines and does regular columns for The Financial Times (of London) on food and travel.